Explore the world of the subconscious and soak up the powerful benefits you can achieve through brain wave frequency therapy and positive subliminal messaging. 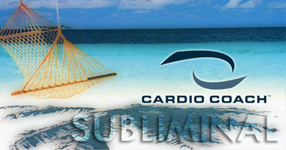 In Cardio Coach™ Subliminal, you will be treated to 30 minutes of relaxing ocean waves accompanied with soothing brain wave sounds & frequencies in addition to recorded subliminal messaging that will call out to your subconscious mind and encourage you to take steps towards staying consistent with exercising. Your brain can be likened to a super computer that takes commands and puts them into action. Subliminal messaging can help you make lasting change! Have you every been in a situation where you planned to go to the gym or roll the treadmill out from out of the closet, only to find yourself changing your mind at the last moment? Does this situation seem to happen a little too regularly? There exists an inner voice within each one of us and this inner voice has control over our actions. The idea behind Cardio Coach™ subliminal is to strengthen your inner voice (your subconscious) so that you take advantage of these split second moments that determine whether or not you do the right thing or give in to the temptation of taking the route of couch comfort. In order to see the change we desire in our physical and mental body, we must strengthen this inner voice to take control. How Does Subliminal Messaging Work? A subliminal message is a message that is delivered below the threshold of consciousness. It is not perceived or understood by the rational, decision making conscious mind. It is however understood by the receptive and easily influenced subconscious mind. Combining certain brain wave frequency sounds in the Alpha, Beta & Theta wave ranges assists by relaxing your conscious mind and allowing you to enter into a very relaxed state when you are most able to benefit from the subliminal messages. At a conscious level, while at times you may be able to hear what sounds like a slight whisper, your conscious mind will not be able to comprehend the messages. Your subconscious mind however will hear the positive affirming messages and through repetition will start to make changes in your thoughts and actions. With your purchase, you will receive TWO 30 minute subliminal tracks. Both are identical with the exception of how they end. In track 1, you will be treated to energizing, refreshing and gradually building music that will gently bring you out of your meditation and leave you feeling awake and energized. Listen to track 1 when you decide to use Cardio Coach Subliminal in the morning or throughout the day. In the 2nd track, there is no ending music. Use this track at night before you fall asleep so that you will remain relaxed. WARNING: Do not listen to this audio track while driving or operating any type of machinery. This track is to be used only at times that you are relaxed and prepared to go deep into mediation. Wait for at least an hour before attempting to drive. DO NOT listen to this track if you have epilepsy.